The sitemap is a file that informs search engines about web pages that exist on a site. It will list URLs that point to your posts, pages, categories, tags, and media. This file will help web crawlers to better index your site. Sitemaps are very important and useful for websites and blogs. It tells search engines about your site links, how often you update the contents and when it was updated last. Search engine bots usually discover and crawl pages from the internal links in your site as well as external links pointing to it. XML sitemap let them find out web pages easily. In WordPress, you can create XML sitemap using plugins. 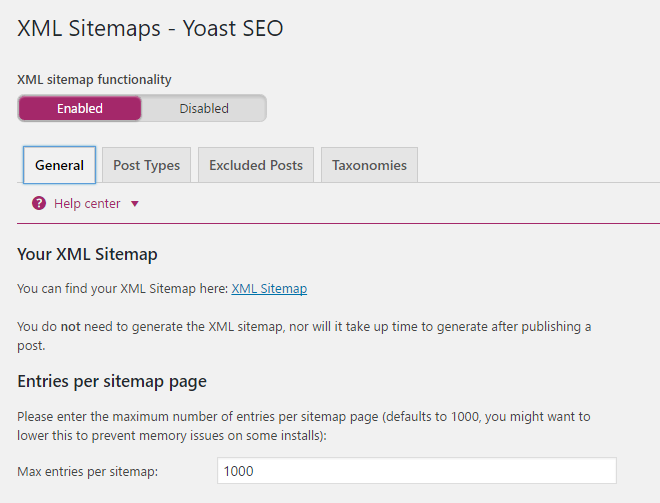 Yoast SEO is an efficient plugin to create and manage XML sitemaps on WordPress. Tap SEO from the left sidebar and choose XML Sitemaps. Click Enabled to activate the feature. You can enable or disable specific post types like pages, attachment, categories, tags etc or exclude certain posts from the sitemap by choosing relevant options. Click XML Sitemap link to view and submit it to the search engines. Google XML Sitemaps is a popular plugin to generate sitemaps in WordPress sites. It lets you customize the website structure in several ways. The plugin will notify leading search engines like Google, Bing upon a publishing a new post. You can include or exclude any content type, categories or specific posts from the sitemap. Priority marking is another useful feature of Google XML Sitemaps. Using this, you can ask search engines how often it should crawl your homepage, posts, and other pages. All in One SEO Pack is another plugin for search engine optimization and creating an XML sitemap. Like above-mentioned plugins, it too allows you to include or exclude certain content types and taxonomies from the sitemap. All these plugins automatically submit your sitemap to the search engines. So there’s no need of submitting it from your end. These are the best free XML Sitemap generator services to create sitemaps for your website. It is useful to generate XML Sitemaps for small websites having limited pages to crawl (up to 500). Enter your website URL in the box and a Sitemap will be generated within a few seconds. Download the file and upload it to your domain’s root directory. Then, inform search engines about your new sitemap. Online XML sitemap generator is another online tool to create sitemaps of any website for free. It allows you to produce both XML sitemaps and image sitemaps with advanced controls. You can include multiple extensions and even set a custom date for the links using the tool.